On 3rd December 2017 Gwen Richards and I spent some hours getting to know the woodland in the lower part of the valley of the River Kirkaig (NC0819/0919). Individual hazels there well illustrate the effects of a wide range of management over many years, from veteran stools with good regrowth in fenced areas to single-trunked trees where grazing pressures are high. 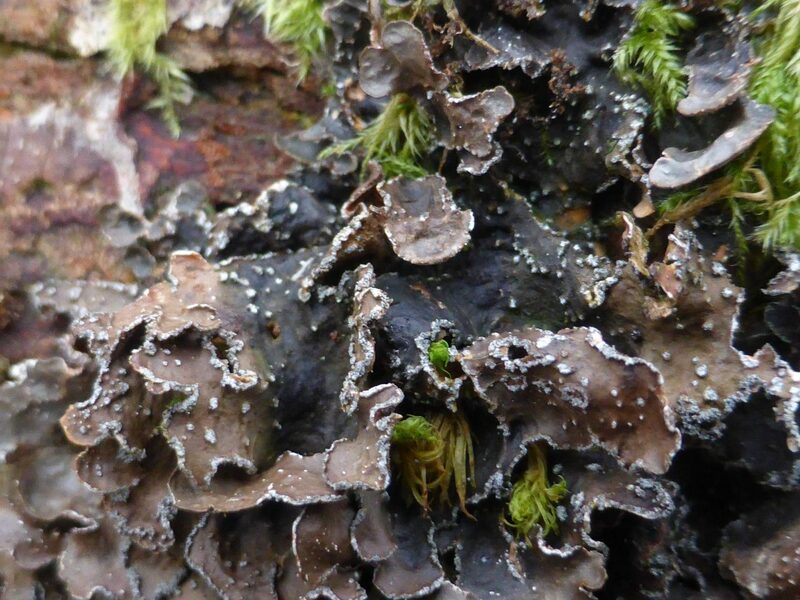 There was a lot of the curious glue fungus Hymenochaete corrugata sticking fallen twigs (some large) to still-growing ones, and a wide range of characteristic lichens, including the Norwegian specklebelly Pseudocyphellaria norvegica. However, a little way up the Kirkaig valley we came across two unusual trees of other species. 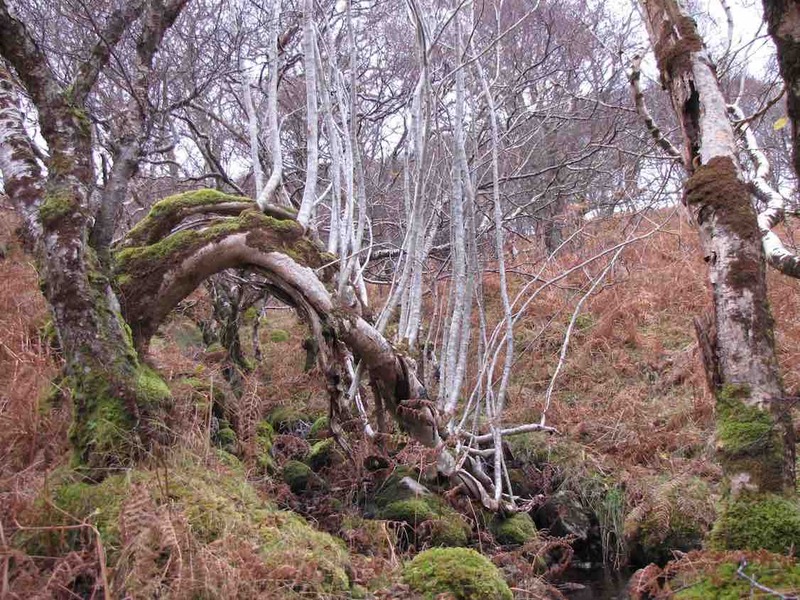 On an ancient dyke above the track there is an old rowan whose trunk has split, possibly as a result of wind damage, and fallen across the adjacent burn. However, with its roots intact, it has continued to grow vigorously, producing a fan of upright branches, a tribute to the life force, if anathema to a forester! Not far away stands a huge, old, multi-stemmed alder, the only example of this species in the whole valley, so far as I know. 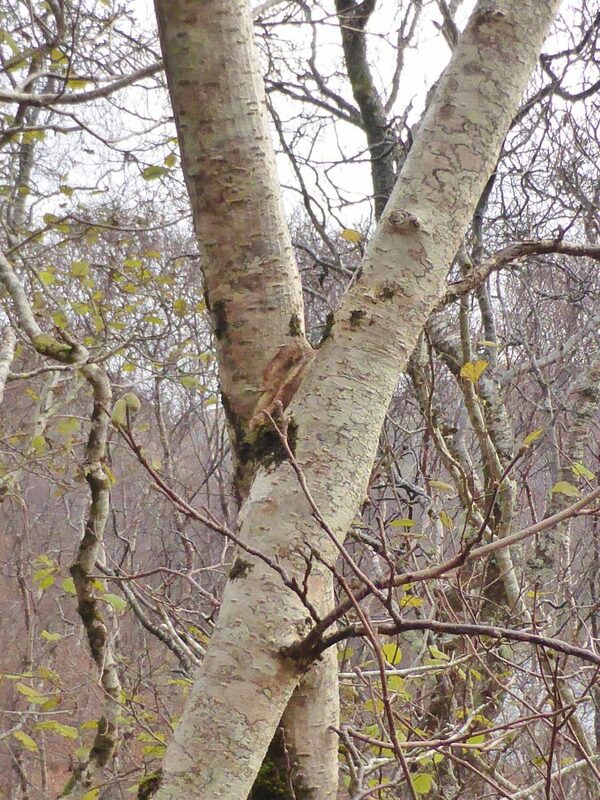 Although only a short distance from the track, this tree curiously eluded surveys for the Flora of Assynt (2002), being first noted in 2003. 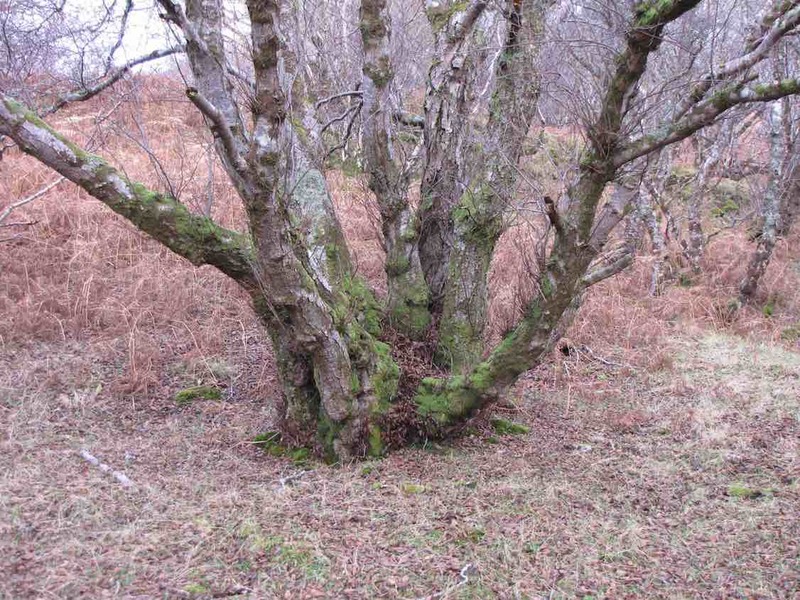 Alder usually grows by the waterside and is quite susceptible to grazing, hence in some parts of the parish it was until recently confined to loch islands. It has since been widely planted and seems to do well where deer and sheep are excluded. The shape of this individual suggests that it may have been coppiced, but a very long time ago, when the young regrowth was able to get away.